The previous article was about Juan D'Arienzo "El Rey del Compas"; his energetic and rhythmical style. Today let’s explore the opposite style of the famous Carlos Di Sarli. Composer, pianist, conductor and arranger, this maestro succeeded to create a style that can be identified from the first notes and which fascinates tango lovers from all generations. Cayetano, a future tango prodigy, was born in Bahia Blanca on 7th January 1903. Probably influenced by his brothers who are musicians, he discovers his vocation: music and piano. Chopin, Liszt, Debussy... are the kind of genius he studied for years ...until he heard a tango. Later, he goes by the name of Carlos which is the one we all know today. With 20 years old, he accompanies his brother Nicolas to Buenos Aires. In the suitcase few dreams, some hope and "Meditación", a tango he wrote in 1919. Who would have thought that it could be recorded 3 years later by Maglio, Canaro and Fresedo? 1927, Carlos meets Fresedo who incorporates him in his orchestra; good opportunity for the future maestro! Osvaldo Fresedo, already famous, conducts several orchestras and introduces tango music in the chic parties of Buenos Aires, with his clean, delicate and melodic style. These characteristics will of course influence Di Sarli who plays for Fresedo during 2 months at Fénix. As a testimony of their friendship, the famous tango Milonguero Viejo, written by Di Sarli and subtitled “Fresedo". 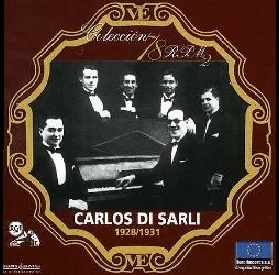 Following this collaboration, Di Sarli builds his own sextet. In 1928, he records his first tangos under the label RCA Victor: T.B.C and La guitarrita. This orchestra enjoys a great deal of success which allows him to perform more recordings until 1931. He also multiplies the shows at Folies Bergere, Fenix, and the Astral theater... He also adds singers: Roberto Deirene would be the first to record with Di Sarli (Sos una fiera - 1929), and then Santiago Devincenzi, Fernando Diaz and Ernesto Famá. In 1934, Di Sarli leaves the city while the orchestra keeps running under the name "Sexteto Di Sarli", and later "Orquesta Típica Novel". He gets back in 1936 in front of his orchestra; unfortunately without recording of this period. 1939, the golden age would not have happened without Carlos Di Sarli! Tango is trendy; D'Arienzo took back the milongueros on the dancefloor. As for Di Sarli, he arrives on LR1 Radio El Mundo and Moulin Rouge cabaret; it is a success! The RCA Victor label extend the agreement. After 8 years’ absence, Carlos Di Sarli is back to the recording studios, this time with a typical orchestra including 3 violins, 3 bandoneons, double bass and piano. 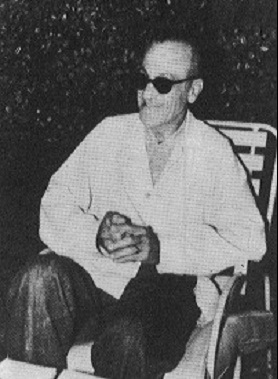 Despite an accelerated beat – trendy at that time – his style is clearly defined: melody, sounding, rhythmical accents, and of course the voice of Roberto Rufino... During this period you will find his most rhythmical recordings, and the contrast is very noticeable as Di Sarli’s style use to be slow. So we start milonguero style with Rufino voice in Corazón (1939), En un beso la vida, Lo pasao pasó (1940), among others En un beso la vida, Lo pasao pasó (1940) y una serie de very nice instrumentals. Two successful years at Marabú and Radio El Mundo, and this is just the beginning… Following the singers Rodriguez Lesende and Agustín Volpe, Carlos Acuña records an amazing tango: Cuando el amor muere (August 1941), perfect link to the true style of the maestro. 1941/1942, Di Sarli slows down the tempo. He combines shows and studio recordings for RCA Victor, while Alberto Podestá join the orchestra. His tango stretches and makes room for emotion. If the success of El Rey Del Compás impacted the style of the orchestras at the end of the 30’s, El Señor del Tango takes on a new melodic dimension. The accents - typical for a milonguero style – remains present, but the melodic phrases prevail in Junto a tu corazón, Nido gaucho (1st period of Di Sarli-Podestá - 1942), La capilla blanca, Tú, el cielo y tú (2nd period - 1944). 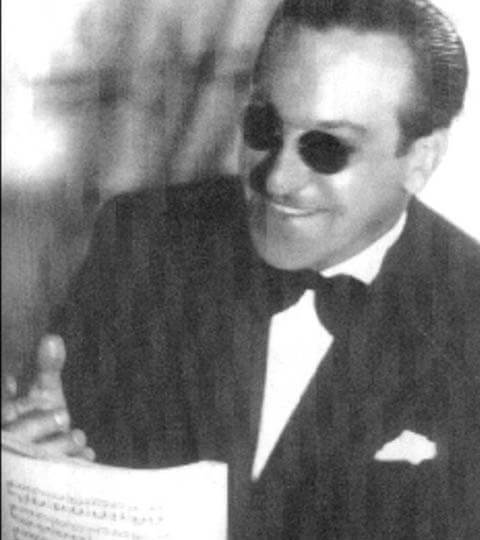 In 1944, Di Sarli discovers the deep and warm voice of Jorge Durán, perfect for the orchestra style which is getting more elaborate, accurate and melancholic: Que no sepan las estrellas, Vieja luna, Tu íntimo secreto (1945), three tangos which allude to love, the see and the moon. Furthermore, two years earlier, Rufino recorded an unforgetable performance on Esta noche de luna: "Si un beso te doy, pecado no ha de ser, culpable es la noche, que incita querer". Following Durán departure, Podestá comes back and sings on 6 recordings (1947), followed by Oscar Serpa in 1948; until the worst news arrives: Carlos Di Sarli withdraws! 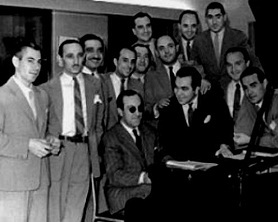 "Bienvenida a Carlos Di Sarli", Radio El Mundo program of March 1951. The audience enthusiasm is at its height when, after a 2 years and a half break, El Señor del Tango returns in front of the piano with a big orchestra including 6 violins and 5 bandoneons. Vocals are performed by Oscar Serpa and Mario Pomar (renamed by Di Sarli). El Señor del Tango is the 1st in Argentina to benefit from the new recording technology (with the label Music Hall), using magnetic tapes and LP 33rpm. In term of audio quality, the result is not yet optimal; the best improvement occurs few years later (from 1954) with RCA Victor. In 1956, most of Di Sarli’s musicians withdraw to create a new orchestra called "Los Señores del Tango", with a very similar style. Carlos rebuilds his orchestra, nearly from scratch, with the singers Argentino Ledesma and Rodolfo Galé, and keeps recording for RCA Victor. The same year, they are replaced by Jorge Durán (returns) and Roberto Florio. You probably know Cantemos corazón, Soñemos (1956), Destino de flor (1957), Adiós corazón (1958), as well as the famous instrumental Bahia Blanca (1957). 1958, Di Sarli leaves RCA Victor and makes his last recordings with Philips. Singers are Jorge Durán and Horacio Casares who replaces Florio. Unfortunately in bad health, Carlos Di Sarli must dissolve the orchestra and retire. We are in 1959, and he dies few months later. The focus is on the whole orchestra rather than individual instruments, so it is very difficult to find any solo. The main structure of his recordings usually alternates between rhythmical and melodic phrases. At the forefront, the violins carry the melody with lyricism, like successive waves. In the background, bandoneons support the same musical phrase, sometimes just whispering in order to get the perfect instrument mix. Otherwise, they play the accents in the rhythmical parts. Di Sarli at piano manages transitions and revives the whole orchestra to the next musical phrase that he likes to punctuate with his famous « bells ». This delicate and typical Di Sarli’s embellishment is performed at piano starting from the basses to the high range. As an example, you can hear it 3 bars before the end of La Cumparsita from 1955. His unrivaled left hand (basses) gives the "compás" together with the double bass and provides the orchestra with a deep resonance. These are few of the main characteristics of Carlos Di Sarli, who true secret is emotion and invites us to "abrazar y caminar". Di Sarli’s bells at the piano, usually at the end of a phrase and/or during transitions. His lyrical and romantic style with the violins at the forefront. His slow tempo, with 2 strong beats per measure. The bewitched combination bandoneons-violins playing the melody together. The lack of solos in general. His ending: 1st chord with the whole orchestra, the second lower and shiny at the piano. From the left to the right, Oscar Serpa, Alberto Podesta, Carlos Di Sarli, Mario Pomar, Roberto Rufino and Jorge Duran.